Mars' surface, like Earth's, is mostly covered by loose, unconsolidated material. On Earth, that is mostly soil, which consists of fragments of underlying bedrock, sediment that has been deposited by glaciers, rivers, or wind, and even decomposing vegetation. On Mars, the unconsolidated material is a mix of windblown sand and dust and fragments of underlying bedrock. The sand is predominantly basalt, whose composition has been only minimally altered chemically by interactions with atmospheric gases and water. In contrast, the dust is brighter and very red, and consists of basaltic rocks that have been broken into small particles and oxidized by exposure to the atmosphere and possibly water. Martian dust is sticky and tends to adhere to exposed surfaces. For the most part, Mars' surface layer of unconsolidated material and is thought to be quite thin, so that it does not hide the planet's geomorphology. Thus, imaging that shows features as small as a few meters (about 10 feet) in size is useful to understand geologic processes that shaped the surface. However, at the wavelengths of light measured by CRISM, it takes only a few tens of micrometers (about 1/1000th inch) of adhering dust to hide the spectral properties of underlying rock. This hides the evidence for its composition. So, for CRISM, it's very important to observe areas that have a minimal coating of windblown dust. 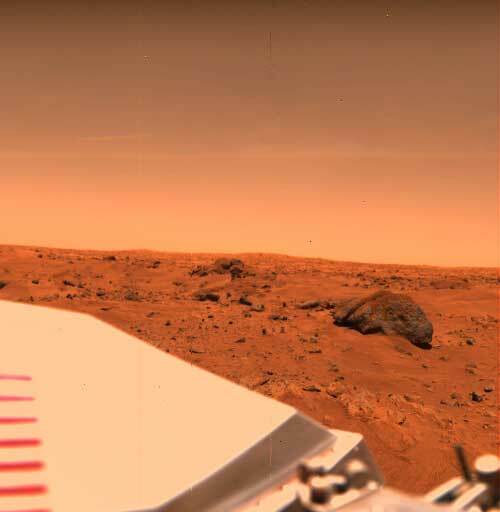 This color image of the Martian surface was taken by Viking Lander 1, the first successful Mars lander, in July 1976. Very little of the surface is exposed rock; most of the surface is windblown dust and sand that "hides" the composition of local bedrock.